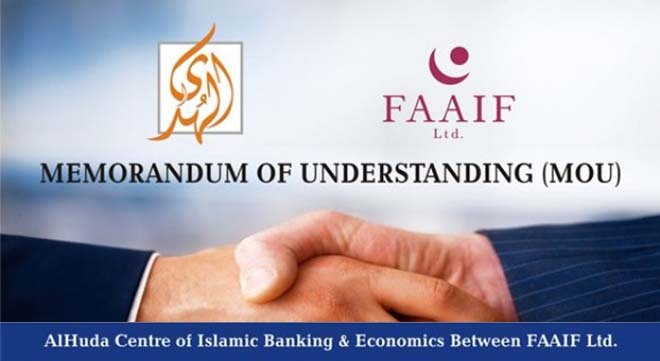 A Memorandum of Understanding (MoU) has been signed between Al Huda Centre of Islamic Banking and Economics (CIBE) and Franco-American Alliance for Islamic Finance (FAAIF) to cooperate in the development of Islamic banking and finance in France and the United States. UAE – A Memorandum of Understanding (MOU) has been signed between Al Huda Center of Islamic Banking and Economics (CIBE) and Franco-American Alliance for Islamic Finance (FAAIF) to cooperate in the development of Islamic banking and finance in France and the United States. Both parties agreed to work together, leveraging their different areas of regional and professional expertise of Islamic finance and synergizing their skills for the broader goal of promoting and developing Islamic finance worldwide, especially in the Franco – American region. MOU Signing Ceremony was held in Dubai, United Arab Emirates today, in which Muhammad Zubair Mughal, Chief Executive Officer of Al Huda CIBE and Camille Paldi, Chief Executive Officer of FAAIF signed the agreement. Both parties agreed to work together, leveraging their different areas of regional and professional expertise of Islamic finance and synergizing their skills for the broader goal of promoting and developing Islamic finance worldwide, especially in the Franco – American region. During the media briefing, Camille Paldi mentioned that she is excited to bring Islamic financial services, training, and expertise to her home country the United States after having spent many years’ education & training abroad in Islamic finance, law, and Shari’ah. With her strong knowledge of Islamic banking, finance, Shari’ah, and law, Paldi hopes to impact the financial services sector in the USA, helping to boost the economy and steer the nation in a new direction. Paldi is excited to utilize her international network to help achieve this purpose, starting with this MOU with AlHuda CIBE. While discussing the importance of this MOU, CEO of AlHuda CIBE, Zubair Mughal said that this is the right time to introduce Islamic financial solutions to the Western world so that they may explore the option of solving financial dilemmas and crises with Islamic financial instruments, derived from the Holy Book. Zubair said that AlHuda CIBE will extend their scope of services in European and American markets through the help of FAAIF. He also mentioned that AlHuda’s services in these regions would include Islamic finance product Development services, sukuk structuring, Takaful development, and Shari’ah advisory. He also mentioned that Alhuda CIBE already has a very strong professional network in Central Asia, the Middle East, and African regions, but through this MOU, Moghul plans to extend their scope in the American markets as well. AlHuda CIBE is a well-established brand in the international Islamic finance and banking industry focusing on Advisory, Consulting, Capacity, and Shariah Advisory services, while FAAIF is an emerging Alliance of Franco – American financial experts, which is headed by renowned legal and Islamic financial expert Camille Paldi. Next: Opinion: Interest-free finance reaches Europe – What’s next?